Now it literally randomly clears every cooking timer. My phone will go to sleep and it clears it. So worthless now. Definitely helps me with grilling multiple items especially when entertaining and cooking for a crowd. Plus everyone wants to check it out and get it when I show them. The upgrade is a nice add to one of most used apps. One of my friends got it to use when he competes at big time BBQ competitions. Plus it is a good looking app --- easy to read & use. Great on the iPhone and it syncs to my watch . I'm just slowly becoming a grill-master and I found this app to be really helpful as I grow. The level of information presented allows you to master grilling while at the same time, the timers make it easy for newbies to have great results. Loved the app before the 2.4 update. Please fix!!! 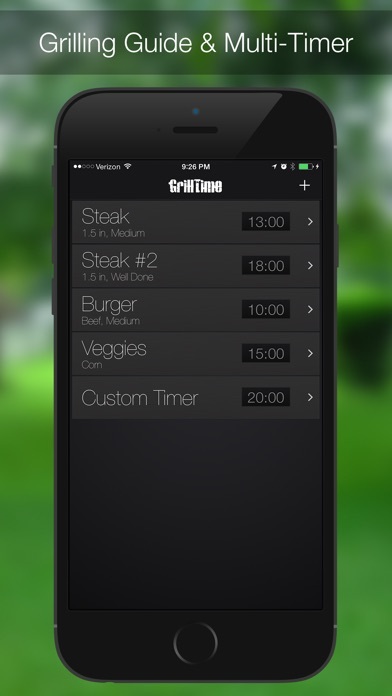 Grill time is a great little app.It keeps things simple which makes it really easy to use. The only real downside is that it doesn't allow you to keep a custom made timer. I like to cook bison steak and it's not listed as a meat option so each time I cook it I have to create a new timer. While this is a small thing it's kind of annoying considering how good the rest of the app is. It would be nice if they included some more exotic meats like ostrich, bison etc. One of the apps I use most. This app is great. Lots of different kinds of food with helpful details about temp and cook times. Customizable for whatever you're grilling. Has really brought my grill game up a notch! I was waiting and waiting but alas no alert to flip my meat. Easy to use. Very generic but can help you keep time when grilling with good suggestions for grilling times. I use butane gas grill that is easy to maintain specific heat so works great for me. It would definitely be harder to try to use on a charcoal or smoker grill. Anyway, as with anything, practice makes the perfect!! Bon appetite!! I use this app for awhile, but once it crashed being in background and spoiled my grill and my grill night. Boo!!! 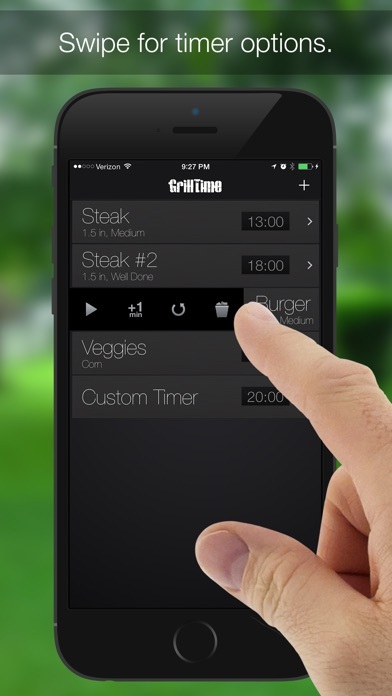 This app turns you into a grill master. Juicy meats, perfectly tender fruits and veggies, and the ability to masterfully coordinate all items to finish cooking at exactly the same time. Works great after inputing correct information when it stays on. App will shut itself off in the background about 50% if you try and do anything else on your phone/tablet and then its scramble time when the timer doesn't go off and you have to remember how long it has been on. Very helpful and the timers are spot on! Gets the job done and helps with grilling every time!! Takes the guess work out of grilling. I like being able to set multiple timers and have them run concurrently. Can't turn down the volume on the flip alert nor can you stop it. No grill times for chicken quarters. U kidding me? I use this all the time. It's really accurate. I would like to see an option where you could set your own timer, not just the ones they have set for you. Nice variety of grilling items. I use it every time. Love this app! Use it every time I grill and everything comes out perfect! Don't know what I'd do without it! This app is my go to for grilling. Has never failed me, but would like to see interface update. I’ve used this app for years. Here are two fixes needed ASAP: 1. The ability to manually sort each time (drag it up or down the list ) so you can arrange the list for like or descending time food items. 2. The option to subtract minutes from preset timers. You can add +1 currently but can’t subtract. Hope to see this needed update or might be time to move to the Weber app or others. Thanks ! There is no provision for multiple steaks to finish grilling at the same time. Also the maximum thickness is 2 inches. I'm color blind, so determining when burgers are cooked completely to my wife's taste without a thermometer is sketchy, it's been raw or charcoal because.. I refuse to use a thermometer. 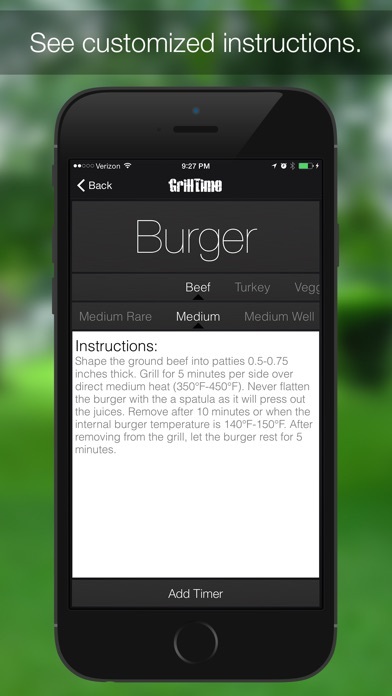 Tonight I grilled perfect well done burgers and I couldn't have done it without this app. Fantastic. I can't wait to try it out for other items. Great App, use it a lot! If tried several others, but this is my go to app for grilling. I use almost every weekend to grill steak, salmon, burgers, bratwurst (brats), and hot dogs. GrillTime wouldn’t start my Weber without it! 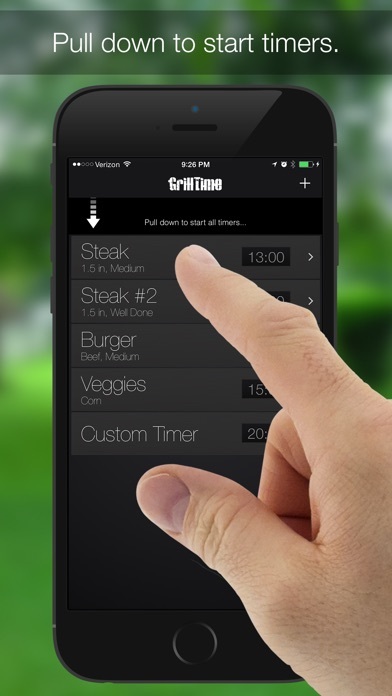 I use GrillTime exclusively for their recommendations on temperatures and cooking time. The program is incredibly accurate. Love it! At present this a timer with some instructions. The times given are pretty close if using an evenly heated grill, and no app would be able to ascertain differently heated areas, that's up to the user. Some of the things it needs, besides a more intuitive UI... 1. An option for flipping alarms. The default wakes people in neighboring houses. 2. A synchronized start time that allows you to start the item taking the longest to grill and then notifies you when to start the next longest, etc. This would result with everything finishing at the same time without requiring you to devote your full attention to grilling and instead being able to enjoy your beer, wine, and friends. 3. Mini notifications that tell you when to flip things requiring more than one flip. Sausages for example. 4. And flipping an item requiring only one flip isn't exactly half of the total cooking time. Most meat needs a little longer on the first side than time on the other side. If these things were included, I'd be willing to pay $3.99 to $4.99 a year. Overall the timer worked well and by blindly following the suggestion, my steaks came out the way my wife and I like them. The UI could use a little work as its not super intuitive and there aren't any instructions. I also wish the timers could be renamed. "Steak" and "steak #2" isn't too meaningful. Is rather be able to rename them "his" and "hers" or whatever. I grilled a couple of steaks last night. My wife likes hers well done and I'm a medium kind of guy. After warming up the BBQ and seasoning the steaks, I plopped the meat on the grill and turned on the timer. I also turned on the microwave timer just in case... When I made the flip, the steaks looked like they were on the right track. And when they came off the grill, my steak was medium and my wife's was well done. Of course hot spots and grill temp needs to be accounted for. But this app takes guesswork out of the timing. Glad I bought it. I never revised an App review before but after giving this one just two stars for just being a fancy version of the already existing timer, I need to correct my error. I don't think it's perfect. The cooking times are, at best, a good approximation so you really do need to keep an eye and, ideally, use in conjunction with the digital thermometer. And it creates a very bad misimpression that you can grill things by basically putting them on teh grill, turning halfway through and then removing. Among other issues, grills have hotter and cooler spots so every pro knows you should be flipping and moving most items around regularly during the cooking process. That said, the timers ARE a pretty good approximation. They cover pretty much everything I've ever thought of grilling and then some. And it really comes in handy when you are grilling several different items on the same grill. Over the weekend grilled three different fish, sausage, pineapple, asparagus and corn all at once. The multiple timers allowed everything to finish with 60 seconds of each other. I've come around. Wonderful app. Keeps my grilling on track. I use this every time I grill! The creator was very helpful when I had trouble with it! Enhanced my grilling abilities tenfold! Love the Celsius conversions, thanks. It will get the job done decently. Since I started using this app, everything comes out just right. No more over or under cooked meat. I highly recommend.